By Ego Eram Reputo, July 7, 2008 in Plugins - Publishing ONLY! Updated 12 December 2010 - 'Recent History' buttons! WhichSymbolPlus allows a symbol or character to be chosen and applied to the canvas from any installed font. Pyrochild for his help with the XML loading & saving. Simon Brown who revised and recoded the original codelab plug-in, and was most generous with his time and source. You will find this plugin located in the RENDER submenu. (New) When you commit a character to the canvas (by clicking OK), the character is saved to the upper most 'History" button (the contents of the other buttons cascade downward). You can easily reproduce the character by running the plugin again and selecting the appropriate 'History' button. Note that the anti-aliasing setting is not saved, nor the color used (the plugin always uses the current primary color). Select or change a font by clicking on the font name. Choose your symbol by clicking directly on it (it will appear in the preview area and also on the canvas). Click OK to commit the symbol to the canvas. Anti aliasing checkbox chooses between smooth & pixelated. Symbol size is changed with the up/down arrows or by typing a number into the size box. Measurements are in pixels (maximum is 1000). (New) Quickly recall any one of your 10 most recently chosen characters by clicking on one of the 'History' buttons. excellent as a webding user I appreciate this will make it vastly easier for others to use these symbols more often. I was thinking of making this a while back.. but I know no C++. If this is CodeLab created than I want src. Feel free to ask if there is anything you want explained. 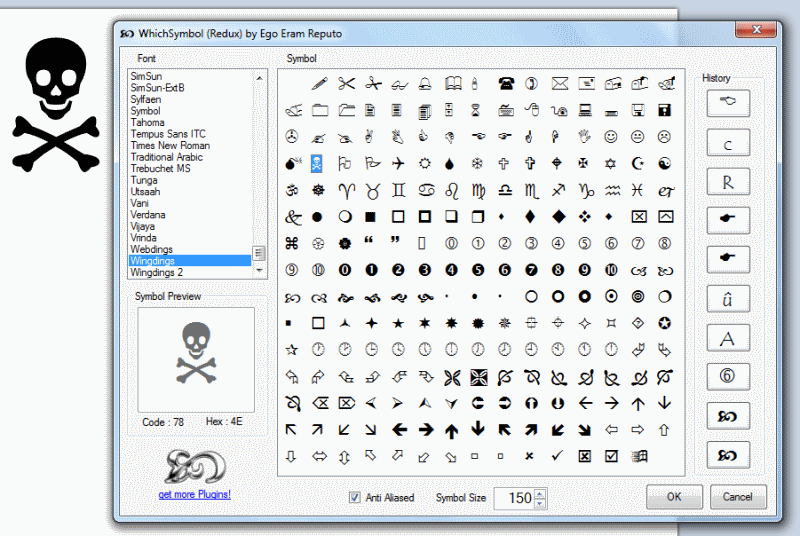 Description: Draws a selectable symbol from the Webdings/Webdings fonts. Found a bug of my own making! The final column of symbols was not being drawn when the "Show All" mode was being used. See the top image in my first post, the top row ends with symbol 31+14=45, but the second row starts with symbol 46+1=47. Thus symbol 46 was missing (the missing link). The *.zip file has been updated to correct this and the source listed above amended. I'm not going to change the images because I'm sure you all get the idea. I only found this because I actually wanted to use a symbol I knew existed and couldn't find it - you can imagine my frustration as I searched for it! Do you mind if I post a bit of a mini tutorial in here explaining how to add new font types and compile in Code Lab? I know that is the first thing I did with your code for all of my Dafont downloaded dingbats. actually Mike I'd be interested in that. I have a few fonts I use for lace making that I hit and pick at keyboard until I get the correct one. I don't mind at all, but I think a new topic might be in order? You're probably best slotting it into the Effects/API forum. Here is my modification of this plugin that supports custom fonts and a (hopefully) simpler dialog. This ZIP only contains the assembley, I will leave the decision to EER over whether to publish the source. I've already published the codelab source, so these modifications are entirely yours. Please feel free to make the source available as you wish. I made few changes to the source, so surely claiming the modifications as mine would be parasitic? That would be similar to calling Babya PhotoPro a joint effort between Rick Brewster and aafuss. This plugin is your project and your work, all I did is add a UI and a few classes. ....all I did is add a UI and a few classes. That's enough for me to call it a joint effort. Seriously. I have updated the original post to link to your version, and retained the original ( for users would like to follow Mikes' tutorial :http://paintdotnet.forumer.com/viewtopic.php?f=5&t=25502 and fiddle with it in codelab). If you believe so I will accept this. One thing, I reccomend attaching the modification to the first post rather than linking to the direct post, as this will allow users to easily select which one they wish to download. I reccomend attaching the modification to the first post rather than linking to the direct post, as this will allow users to easily select which one they wish to download. 2. Column numbering uses the selected font, so if the font doesn't have digits, the column offsets are not numerals. See Webdings/wingdings selections. You might want to tickle the font used for the column offsets (top) to the same one as the row offsets (left). If you want to make these minor changes, I'll then provide the link in my original post. screen shots of medical software - I can't use it; which a pity really. I liked the idea.